Skil Belt Sanders - Aggressively yours! Sanding with the help of a Skil Belt Sanders would be a pleasant experience thanks to the power. This tool smoothes wood and other materials and is the choicest friend to the carpenter, wood worker, the cabinet maker. This is an electronic hand tool and uses the sand paper to smooth materials like wood, metal and plastic. The main components of a Belt Sander are motor which is encased and has drums which spin the sandpaper in a belt fashion. The Sandpaper is properly trimmed to fit the belt which is tightly latched. Among the different types of sanders, the belt sander is used for the initial stages of the finishing purposes. The working advantage of these belt sanders is their ability to remove lot of wood or material proficiently in a very short time. When the material is paint, it can remove the residue easily or strip paint from wooden furniture. They could work on old furniture to resurface it. Their ease of use greatly benefits the wood worker since they could also help in shaping. 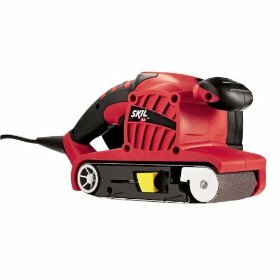 Skil Power tools is a leader with portable electric tools, their cost-conscious power tools are durable. The Skil Belt Sanders are a wonderful do-it-yourself companion, skillfully managing to sand large areas. Their 3 "× 18" belt sander is their sole product but comes with two power variants of 4.5 amps and 6.0 amps. This tool is best for leveling wooden floors, skimming the surfaces of countertops from stains, glue or thick coats of paint. One can clean beams on decks or picket fences. Amongst wooden articles, they can level the legs of table and take care of flushing edges when uniting boards. This performs the additional task of working on vertical surfaces too performing more like a hand sanding pad! Fitted with a powerful 4.5/6.0 amps of power, Skil Belt Sanders sands wooden surface with the help of hook and loop pads. Their belt alignment is intact and centered, thanks to their patented auto track belt alignment system. This also ensures that when there is a need, the speed can be accelerated thus saving time. The surface is well protected by this system. The use of removable Micro filter dust canister helps to keep the working area clean of dust and fine articles. It performs Flush edge sanding where it sands till the edge. Dust collection is very important for wood workers as there is a potential health hazard in this profession with fine articles. This Skil Sander also has a vacuum adapter attachment used at wet and dry places thereby dusting as the operator sands. The lock-on button is an extra-comfort especially during prolonged use. The soft-grip handles is ergonomic and convenient. The user is provided with 80 grit sanding belt in the package. The 6.0 amps model has 33% more power as to the 4.5 amps. Some people have problems with belt adjustment resulting in wood wastage. Belts have to be frequently changed. Skil could improve this aspect and the size of the Micro Filter bag too. Skil power tools are one of the lowest in price but not on quality! Return From Skil Belt Sanders Page to Home - Finishcarpentryhelp.com.